Because the number of options is often limited, small island states tend to find it uncommonly difficult to strike a balance between population, envi­ ronment, and development. Relatively high population density and small land areas, without much in the way of natural resources, do not provide the best of circumstances for improving the living conditions of the popu­ lation, especially a fast-growing one. The result is often stunted economic development and environmental stress both on land and offshore. The developments in the island state of Mauritius over the past 30 years, however, can serve as an inspiration and illustration of how extremely ad­ verse conditions can be overcome. In the early 1960s Mauritius was trying to cope with rapid population growth, extreme poverty, and grim economic 2 prospects. Population density was 324 inhabitants per km , total fertility was 5.7, and GNP per capita was less than $200. In 1990 the situation in Mauritius was radically different. Although 2 population density had increased to 527 inhabitants per km , total fertility had dropped to 2.0, and GNP per capita had increased to $2,310. Economic stagnation had been replaced by steady growth and full employment, and environmental problems were being addressed as issues of high priority. 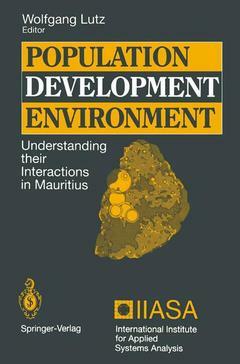 1 Introduction.- I: What Do We Want To Understand?.- 2 Background: People and Development.- 3 Simulation Models of Demographic, Economic, and Environmental Interactions.- II: Understanding Through History.- 4 People on Mauritius: 1638–1991.- 5 From No-Man’s-Land to a Congested Paradise: An Environmental History of Mauritius.- 6 Water Resources and Water Management.- 7 Sugar Cane and Other Agriculture.- 8 Industrial Development and the Labor Force.- 9 Sustainable Tourism.- 10 Energy.- III: Understanding Through Modeling.- 11 Philosophy of the PDE Approach.- 12 The Population Module.- 13 The Economic Module.- 14 Land Use and Regional Distribution.- 15 Modeling the Water Systems.- 16 Scenarios for Mauritius, 1990–2050.- 17 Alternative Histories Since 1962.- IV: Our Present Understanding: What Have We Learned?.- 18 Lessons From Mauritius in the Global Context.- 19 Epilogue: How Useful is the Mauritius Study for Other Parts of the World?.- References.